You’ve heard about them. Maybe you’ve even tried a few. But if you’re a serious foodie, then it’s time to break out your bucket list, because this is the ultimate guide to the world’s weirdest natural foods! 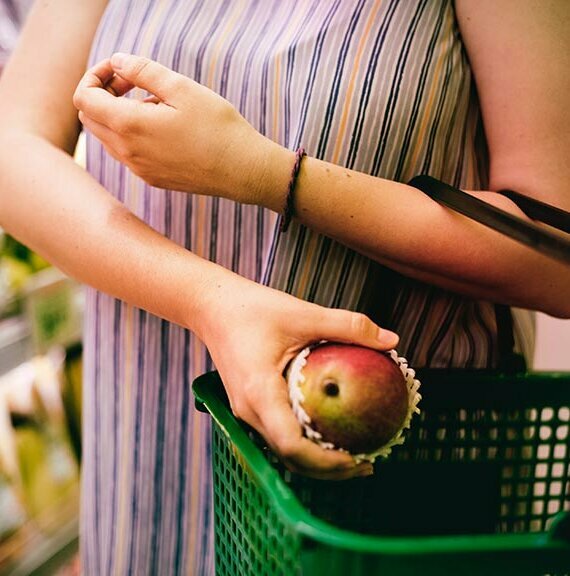 Whether you’re planning a culinary trip around the world or just to your favorite exotic grocery, it’s time to add a few bullet points. The first time your mom put an apple in your school lunch box, your interest in nature’s juicy wonders may have piqued. With the years passing, you’ve tried pineapple, lychee, and kiwis, coconuts and other. But if you think you’ve seen some wild-tasting and strange-looking fruits, then you’ve got another think coming. While most of the fruits on this list are edible, the achiote, a spiny red fruit originally from the tropical Americas, is not classified as food. 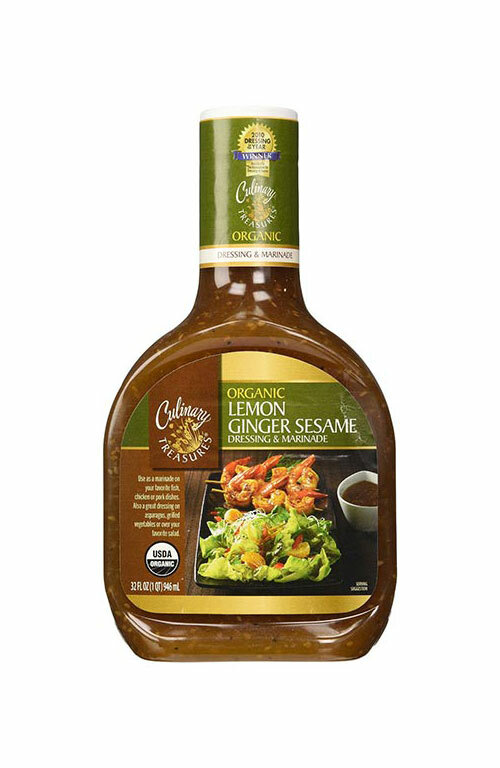 Instead, it functions as a colorant and a condiment, and it is sometimes used to make a pasty marinade or to dye butter or cheese. People have also used achiote to make lipstick for perhaps thousands of years, but unlike your typical cosmetic, this fruit also has anti-fungal and anti-bacterial properties. Japan may be the world’s capital of strange food, and whether you’re looking out for apples in protective sleeves or square watermelons, you’re likely to see some unusual stuff during your visit. But of all the marvels of the Japanese culinary scene, akebi might be the strangest one. 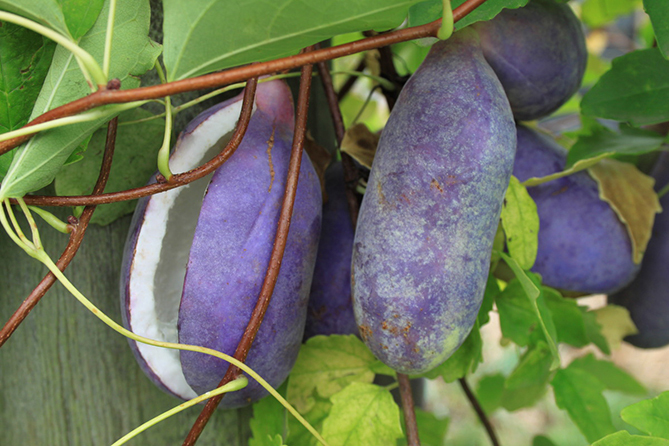 This bright purple fruit appears for just a couple weeks in the early part of the fall season, and then only in northern Japan. You don’t need to wonder when an akebi is ready to eat. As if to invite hungry guests, it spontaneously pops open when it’s ready for consumption. 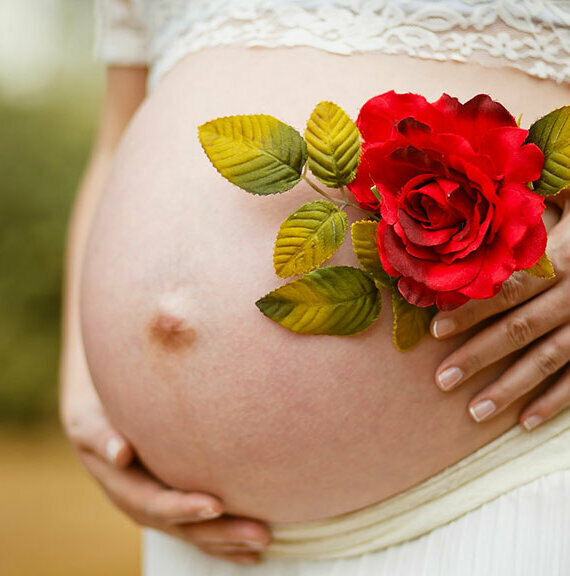 Maybe this isn’t so odd – after all, the fruit is sweet because the plant wants you to eat it, besides, that’s how it spreads its seeds! Do the accommodating akebi a favor next time you’re in the Tohoku area of Japan and try some of it. If you often visit Asian grocery stores, there’s a huge chance you might have run into this enormous, rough-husked, extremely popular fruit. 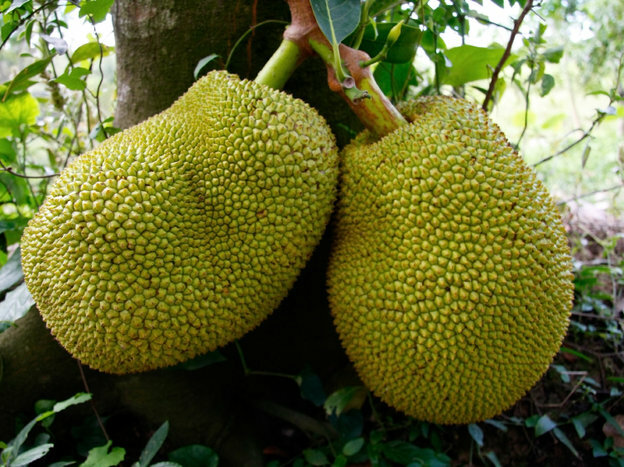 If you’ve ever looked at a jackfruit and wondered what you would do with it in the kitchen, it’s time to reassess: your question ought to be “what wouldn’t I do with this in the kitchen!” Jackfruit seeds are deliciously roasted, jackfruit juice can be drunk straight or boiled into candies, and jackfruit flesh tastes like a combination of apple, pineapple, banana, and mango. In Vietnam, it’s even made into soup! 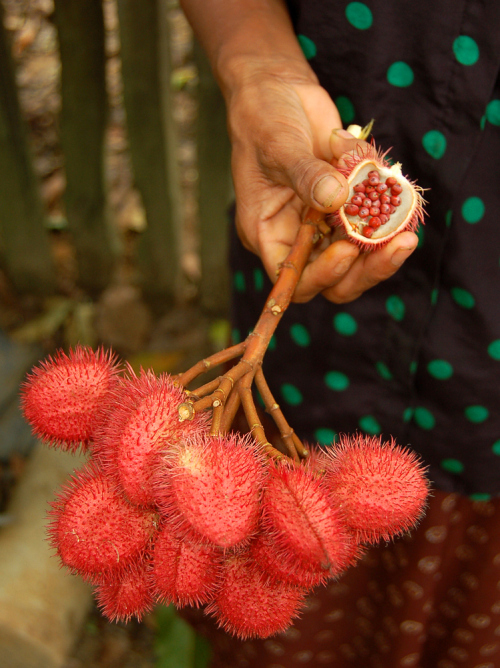 From Vietnam to India to South America, this is a worldwide popular fruit, and for good reason. 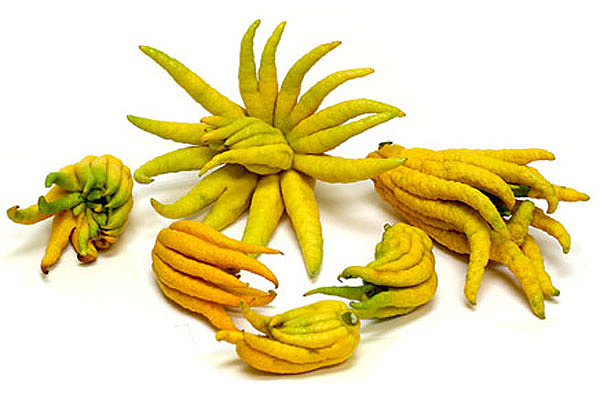 Most fruits on this list are fairly straightforward oblongs or balls, but the fingered citron, also known as Buddha’s Hand, takes the cake for oddity. 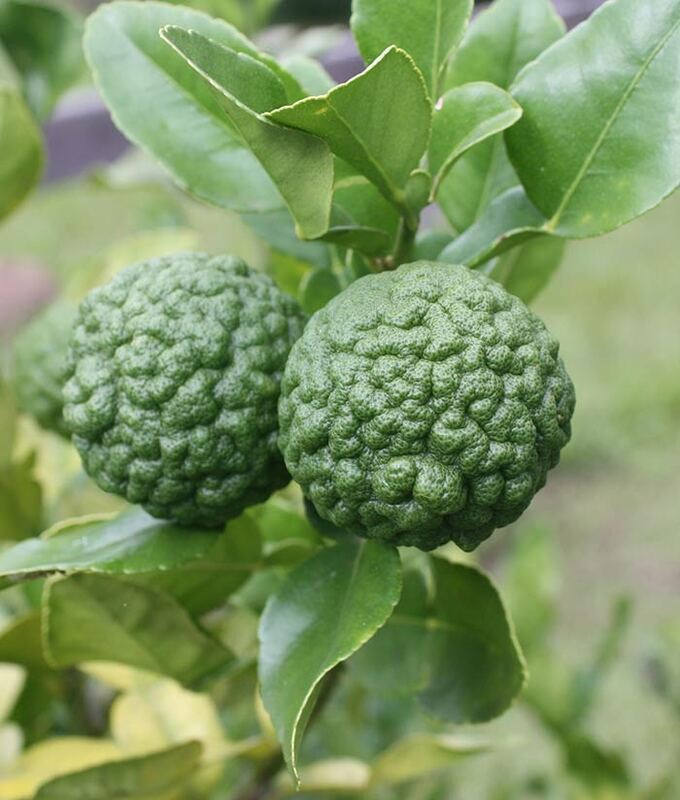 This East Asian fruit, possibly originating in northern India or China, is a popular offering in Buddhist temples because of its resemblance to folded hands in meditation. Sometimes the “closed fingers” form of the fruit looks a little like a resting palm. But when the “fingers” are open, this fruit looks like a mutant octopus! It’s related to lemons and smells fantastic. It’s possible that it’s more popular as an aromatic room freshener than as a fruit! Still, many chefs like to use it in desserts and preserves. 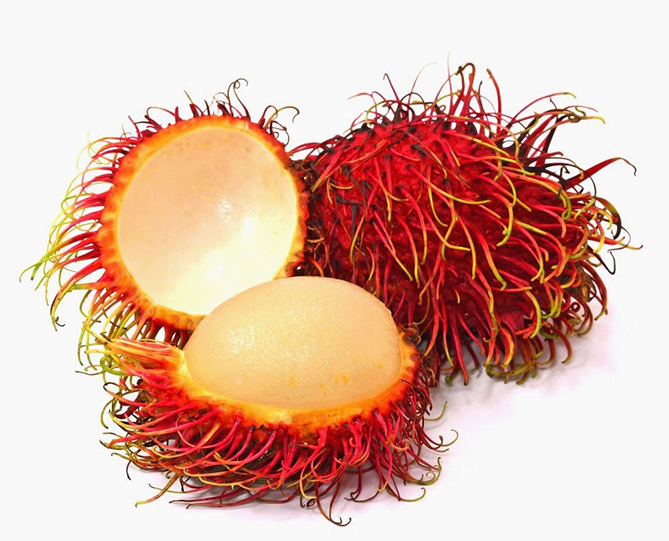 In the Malay language, its name means “hair”. It’s easy to see why: this berry looks like it needs a thorough combing. But once you peel away its wild red exterior, the flesh is a surprisingly modest white oblong, which tastes very much like grapes. Though old wives’ tales hold that the seeds are poisonous, that’s actually not accurate. In fact, the seeds have a pleasant nutty flavor when roasted! It’s not hard to see why rambutan is such a popular garden item. 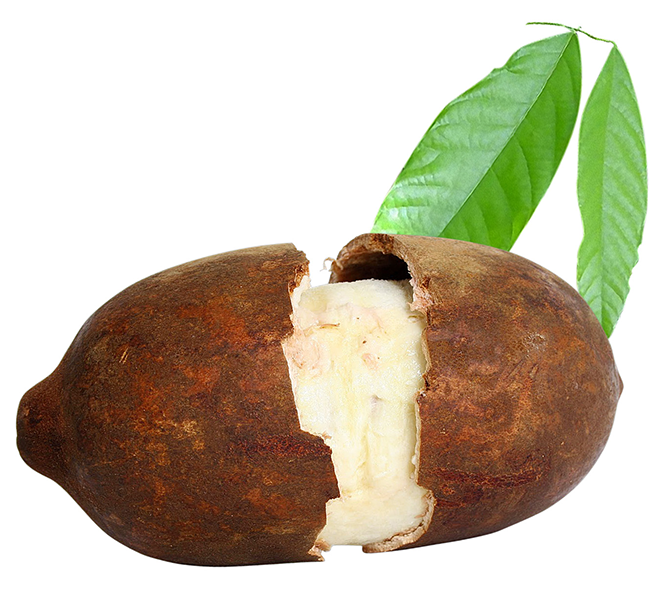 Originating in southeast Asia, it is now popular all over the equatorial world. Question: what was Mark Twain’s favorite fruit? 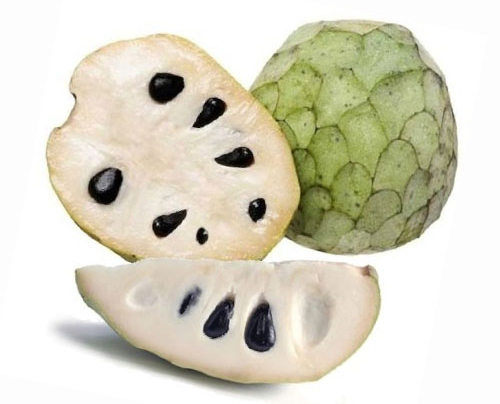 If you answered “cherimoya”, then you would be absolutely correct! This Central and South American fruit is green and scaly on the outside, white and pulpy on the inside, and delicious all the way through. 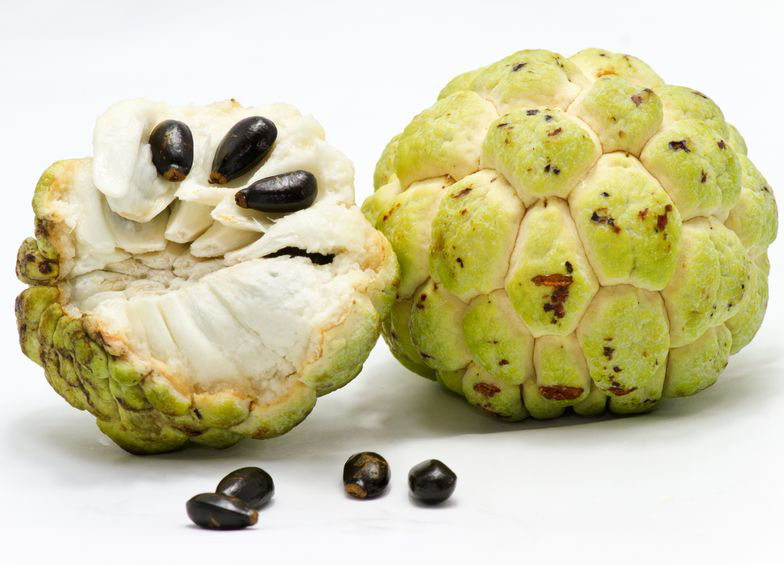 Due to its creamy texture and sweetness, it’s also known as the custard apple. The Moche people of Peru loved this fruit so much that they depicted it in their pottery designs. 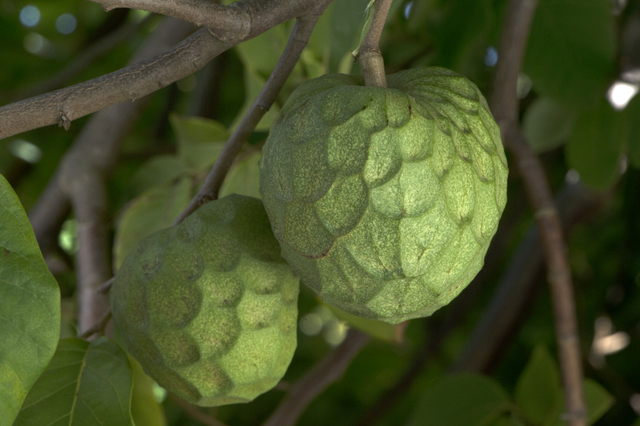 Though it’s a tropical plant, cherimoya loves high altitudes and cool temperatures. Don’t eat the seeds, though – they’re poisonous. 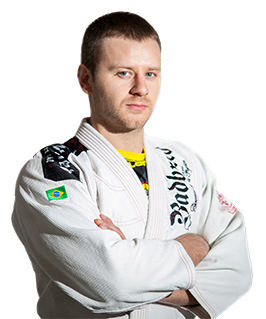 If there were a contest for complicated names, the jaboticaba would probably win. If you can’t get your mouth around the name, try calling it the Brazillian grape tree. When you see the fruit, you’ll understand why! 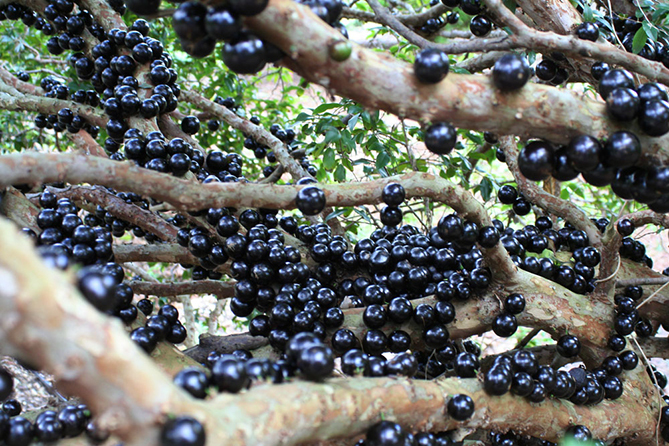 So purple that they’re almost black, the fruits of the jaboticaba are round and sweet, with a white pulp and a seed that you spit out. (According to several of the author’s younger creative consultants, this is the single best part of any fruit.) Look for them growing directly on the trunk of the mature jaboticaba tree, mostly in Brazil, but also in Argentina, Paraguay, Peru, and Bolivia. 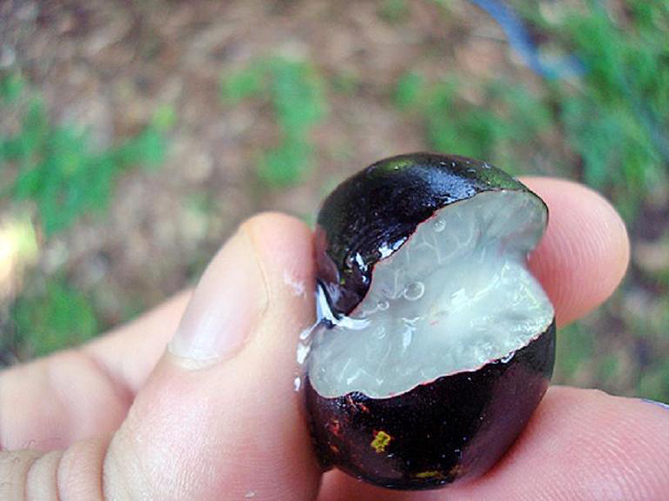 When you visit, also keep your eyes open for jaboticaba jellies and – especially – jaboticaba wine. 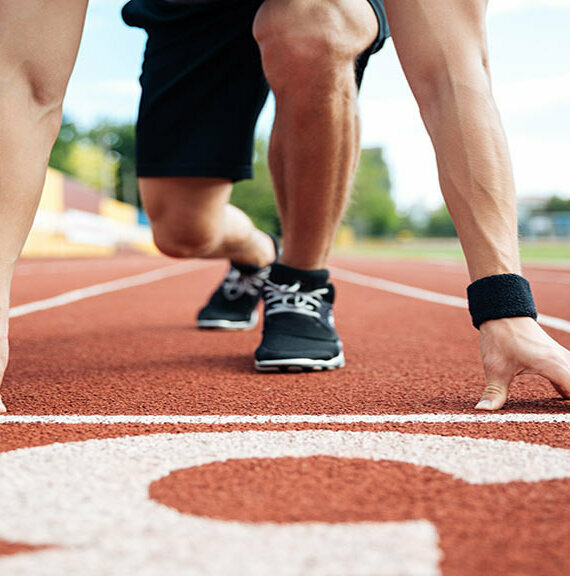 Jaboticaba has several anti-cancer properties that have researchers excited. Believe it or not, this fruit is one of the most wildly successful imports to the New World – in Jamaica, that is! Ackee probably came to Jamaica on a slave ship some time before 1778, and today, ackee and saltfish is Jamaica’s national dish. 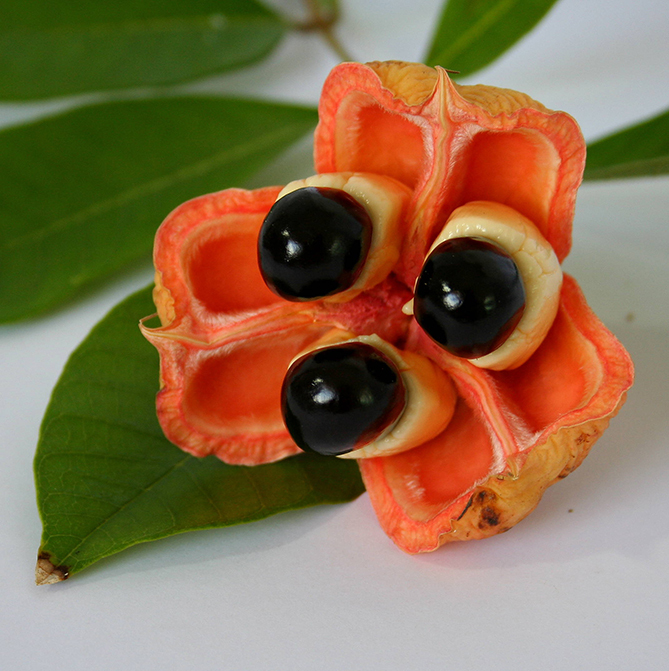 Like akebi, ackee splits open when it’s ready to eat, revealing three big, black seeds surrounded by spongy white flesh. To eat an ackee, you have to remove the meat and boil it, but only when the fruit is ready. 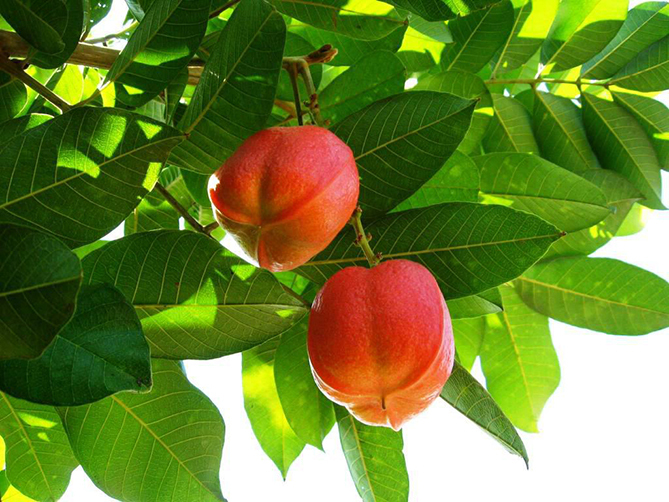 Unripe ackee have been occasionally known to cause food poisoning. Behold the humble miracle fruit. Doesn’t look like much, does it? To get the full effect of this remarkable little plant, you’ll need a lemon on hand. 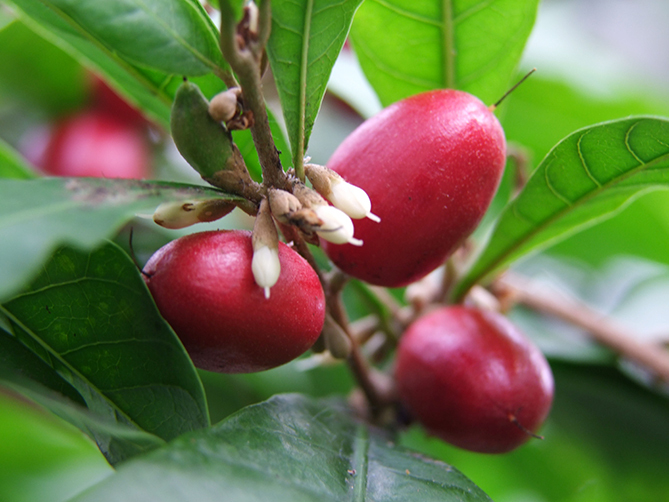 Thanks to a unique chemical called miraculin, which changes your taste receptors, the miracle fruit’s juice makes sour things taste sweet. 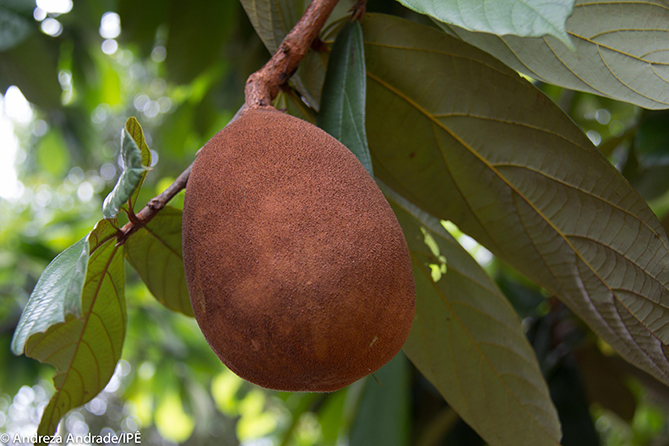 Tangy on its own, this fruit originates from West Africa, where locals have traditionally chewed it before meals. Today, people use miracle fruit for “food tripping” parties, where a typical menu consists of sour pickles, radishes, hot sauce, limes, lemons, and of course, lots of miracle fruit. Now THIS is a weird fruit. Originating in Africa and now grown equatorially, it tastes like a combination of cucumber and banana. If you split it open, you’ll find green flesh surrounding white seeds! 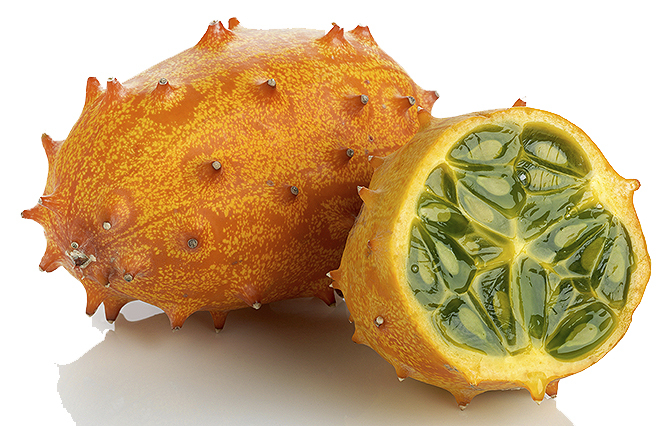 Most fans slurp up the pulp and spit out the seeds, though if you’re a diehard horned melon eater, you might want to eat the rind and seeds for an extra vitamin C boost. 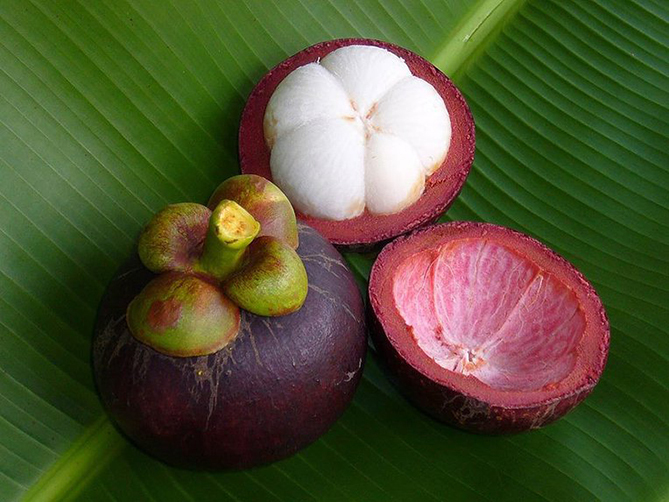 If you want to sample the heavenly mangosteen, you’ll find yourself in good company: legend has it that Queen Victoria herself offered a reward of 100 pounds to anyone who could bring her a fresh one! 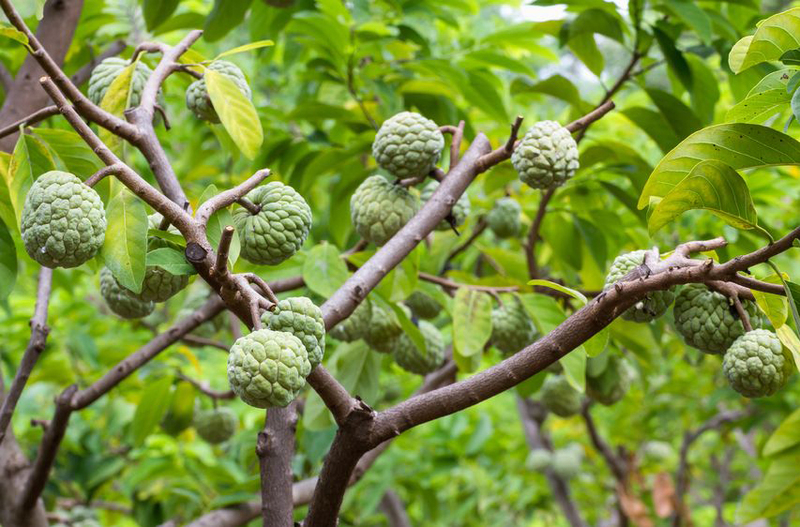 Though this was probably made up by an ambitious fruit importer, the sweet and tangy taste of this fruit has it growing in popularity all over the world. 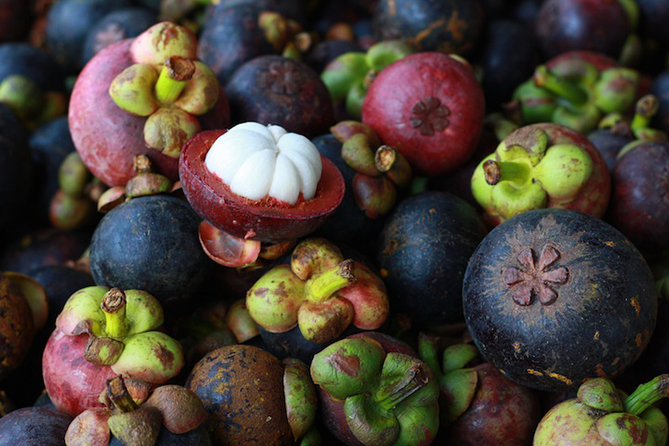 Due to import restrictions, you may have a tough time finding a mangosteen in the United States, but they’re readily available in Australia and sometimes in Chinatown markets. 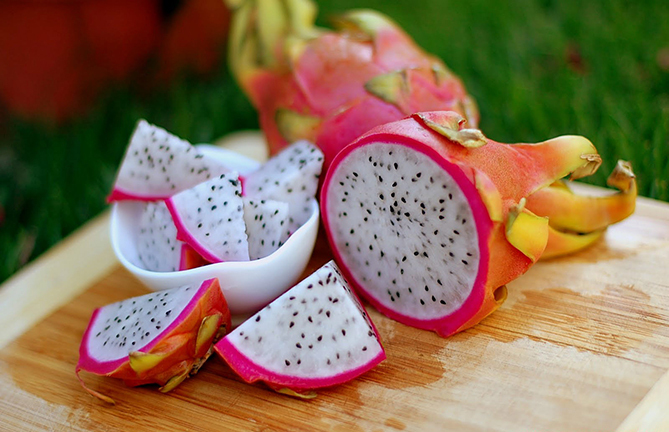 “Dragon Fruit” is an apt name for this popular southeast Asian treat. Its husk is red and covered with dramatic, leaflike, green-tipped “flames”. 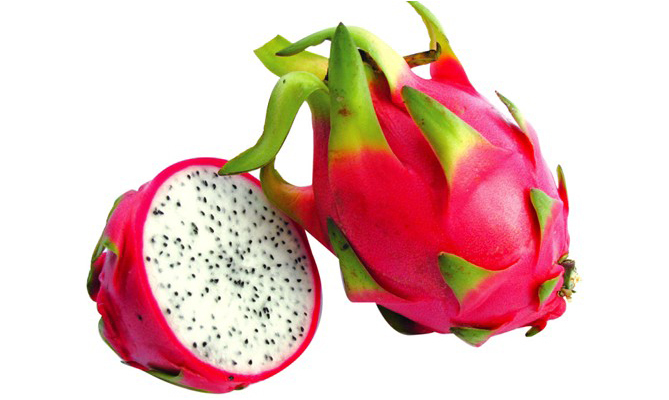 But once cut open, the pitaya becomes unremarkable, even bland. 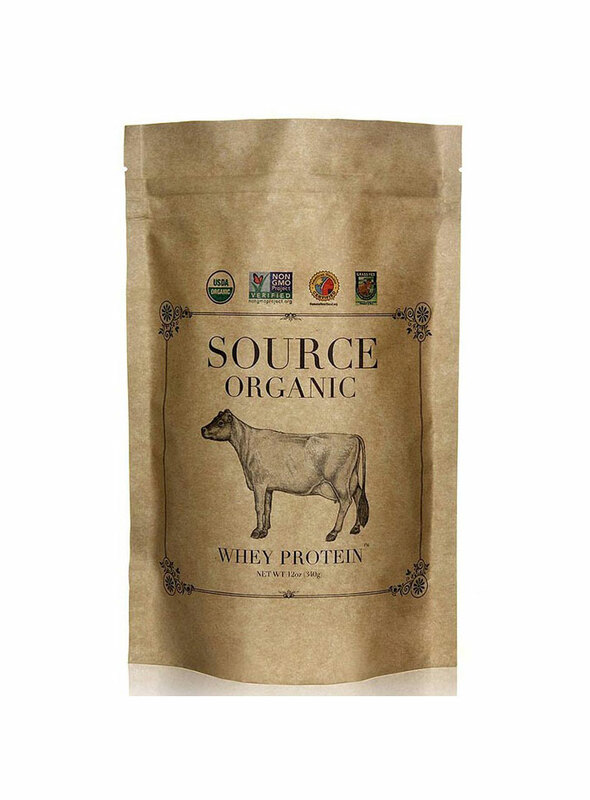 Its taste is mildly sweet and fairly low in calories, with hundreds of tiny black seeds that have a nutty taste. 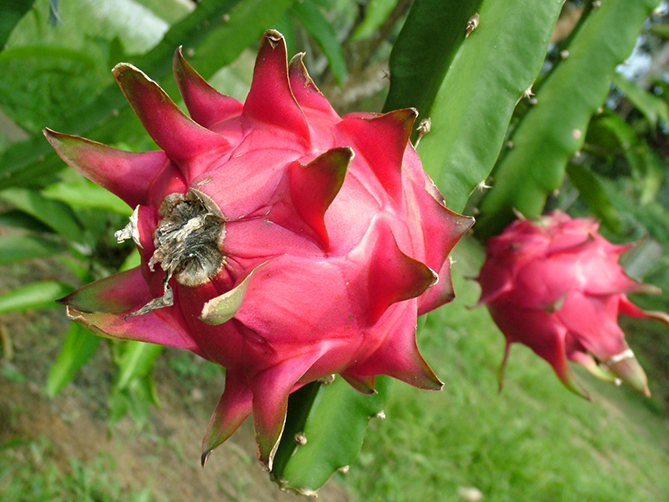 Pitaya can be squeezed into juice and even made into wine. It’s been a valuable staple for native North American peoples for thousands of years, but today, it might be more well-known for its beauty than for its quality as food. 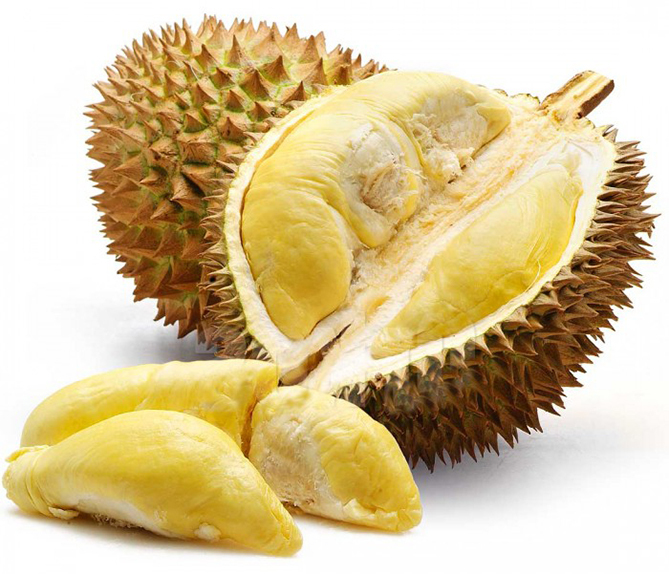 One of the things people say about durian is that it tastes like Heaven and smells like Hell. Actually, the smell can vary with the cultivar, from varieties that smell like turpentine to varieties that smell like roasted almonds. Once you get past the stench, however, you’ll be pleasantly shocked by the absolutely exquisite, nearly indescribable taste. Something like a creamy almond custard, durian’s divine flavor is also, according to British naturalist Alfred Russel Wallace, redolent of cream cheese, onion sauce, and even sherry. 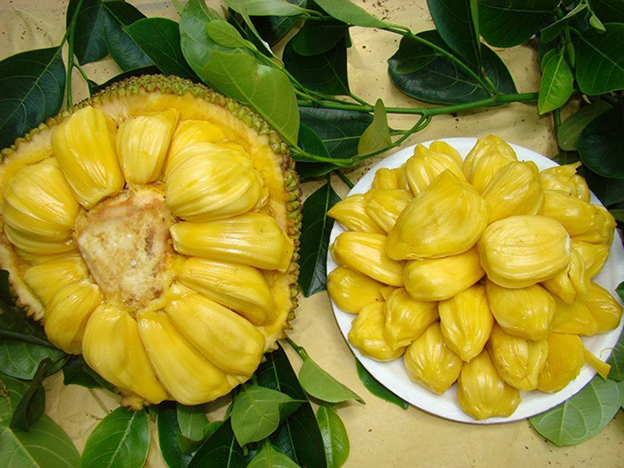 Its intense popularity in Southeast Asia has earned it the moniker “king of fruit”. When you find yourself in durian country, be sure and try durian ice cream, durian candy, fermented durian, and durian with sweet sticky rice, but whatever you do, don’t try to take a durian on the subway with you. Due to their powerful odor, they’re not allowed. Never did a name so aptly describe a fruit. Uglis are, well ugly. They’re nondescript, rough, wrinkled, dirty-yellow balls of blah. But once you peel them, you’ll be glad you gave them a chance! Sweet and a little grapefruit-y, these relations of tangelos are reminiscent of the citrus cultivars from which they probably evolved accidentally. 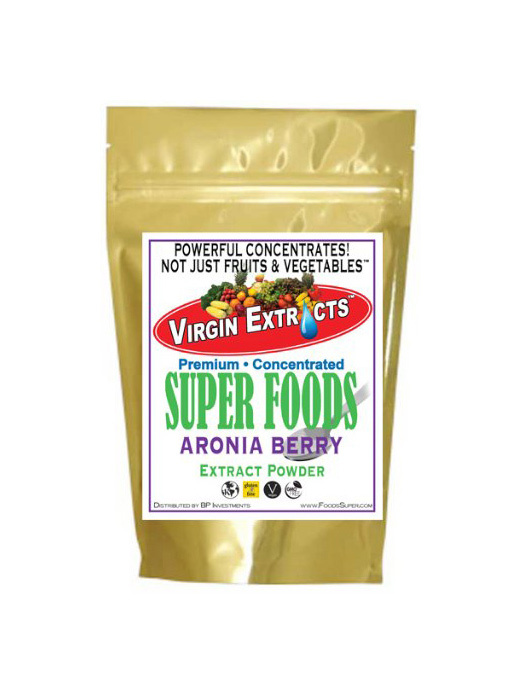 They originate in Jamaica, but are fairly easy to find in groceries that sell multicultural or exotic food. You may have seen Chinese lanterns hung up around Thanksgiving time, but did you know that this popular ornamental is just one of many species of physalis, many of which are delicious? It’s true! 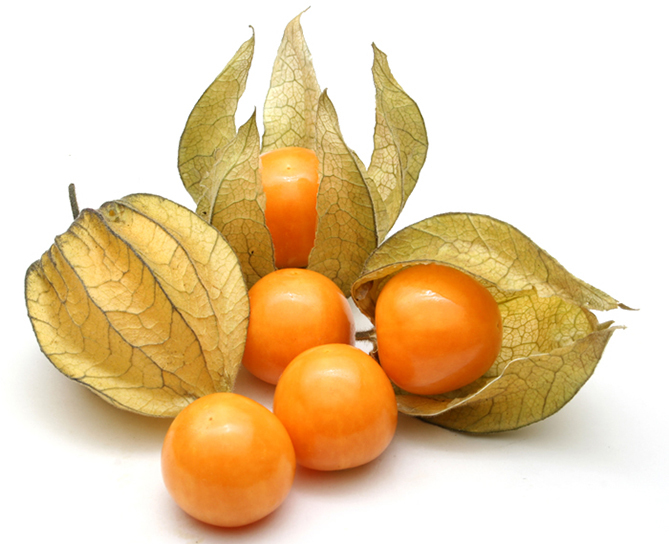 While some physalis fruits are merely decorative, others, like the tomatillo, taste like pineapple or strawberry. In fact, physalis are closely related to tomatoes, though they’re not as hardy. You’ll find most of them in subtropical regions like Mexico and South Africa. That’s not a piece of military tech – it’s a delicious, sweet and sour yellow fruit from southeast Asia! 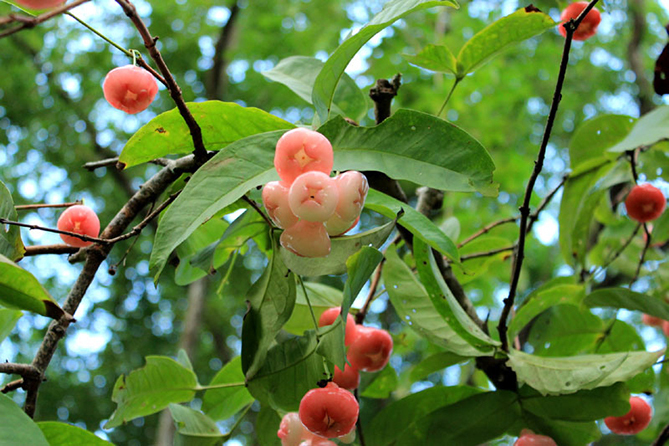 These smallish, round, somewhat fuzzy delectables grow in bunches on a tree related to mahogany. 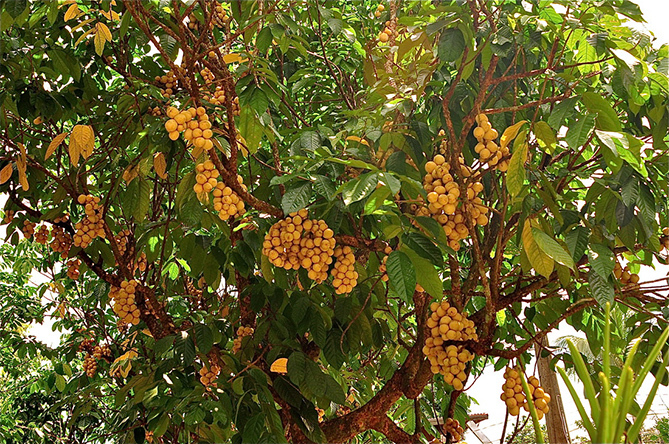 One fun harvest pastime is to shake a langsat tree and watch ripe fruit come raining down! 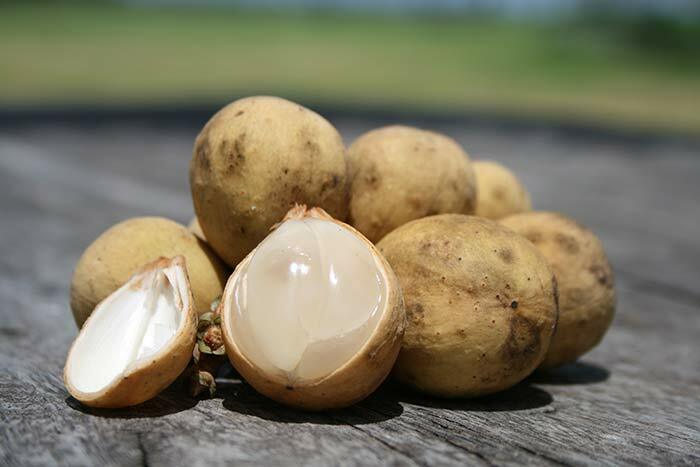 Not only do people eat langsat fruit raw, but it also makes a fine syrup. 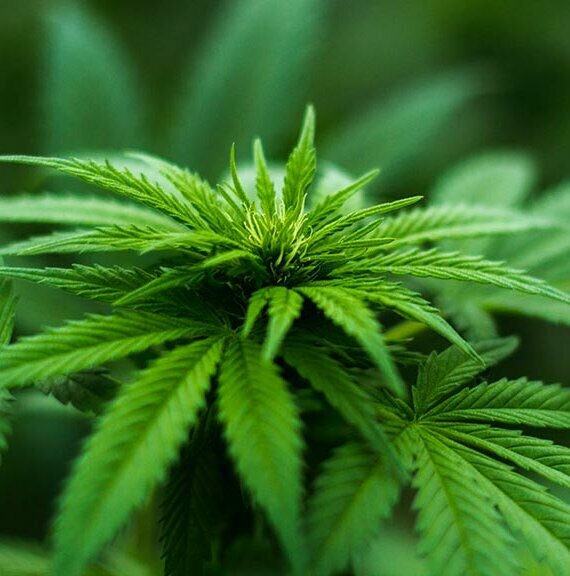 The entire plant has a number of medicinal uses, including treatment of dysentery, malaria, and scorpion stings. For dramatic effect, you can’t beat the aguaje. Fire-red and scaly on the outside, bright yellow on the inside, this ovoid fruit, the product of a certain kind of palm tree, is covered with scales. Diners have to scrape these off before diving into the crisp flesh beneath. By many accounts, the meat tastes a bit like a carrot, though when it comes in a package like that, it’s probably a lot more fun to eat. As if this weren’t all bizarre enough, aguaje floats, a useful adaptation to the wetlands of Peru. 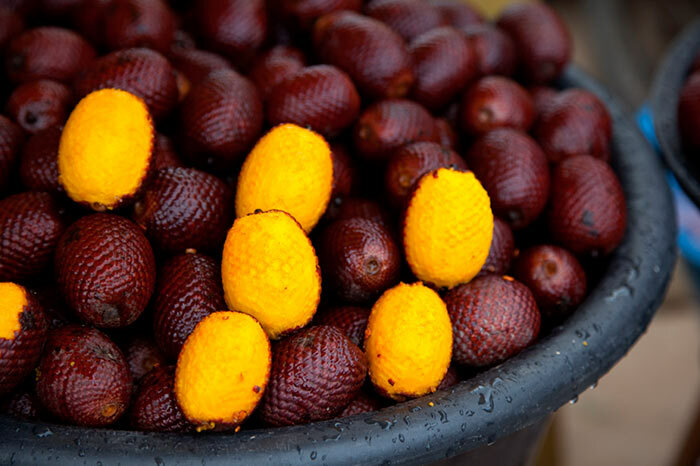 According to National Geographic, aguaje is a potential food-fad like acai, partly due to its incredibly high vitamin A content. 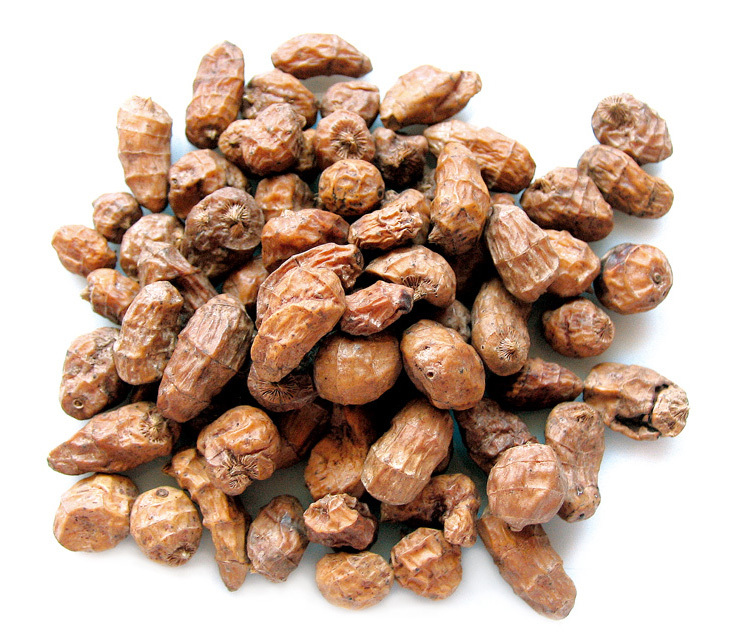 If you like cacao, the plant that gives us chocolate, then you should try its cousin, cupuaçu! It’s said that the pulp of this fuzzy, oblong South American fruit smells pleasantly like a cross between chocolate and pineapple. The juice tastes like pear with a hint of banana, and in case that’s not exotic enough for you, cupaçu may be marketed as a superfruit flavor someday, just like acai is now. 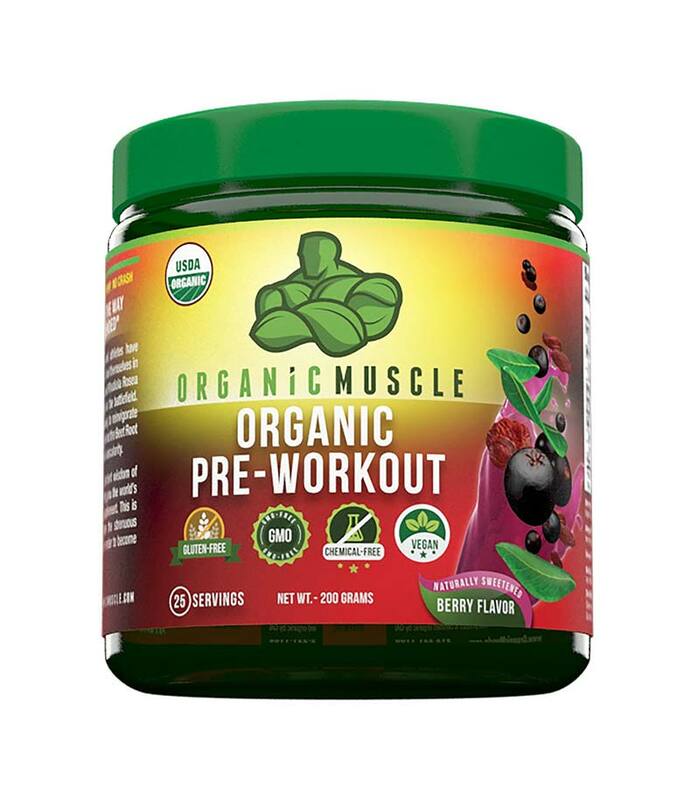 It’s a good addition to smoothies and shows up in a lot of hydrating body lotions. 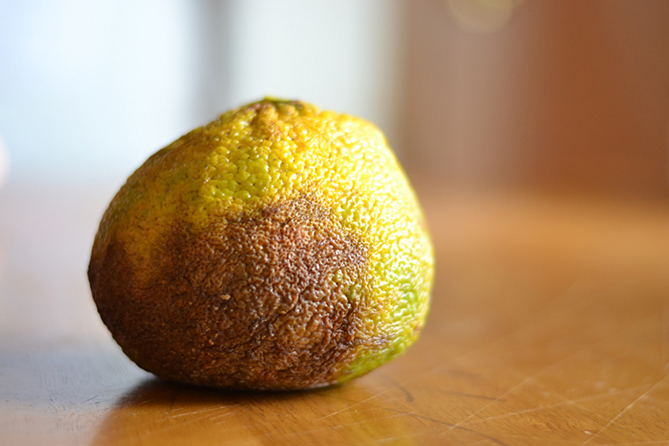 Segmented like an orange, this fruit is known as a good astringent. However, unlike most of the fruits on this list, it’s not primarily known for the taste of its fruit. 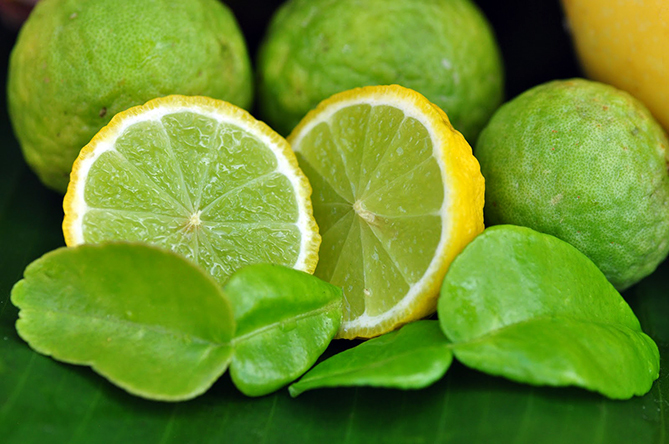 (After all, it is a lime!) Its juice ends up in cleaners and shampoos in Thailand and chefs like to use the leaves to make chicken, snails, and the flavor base kroeung. 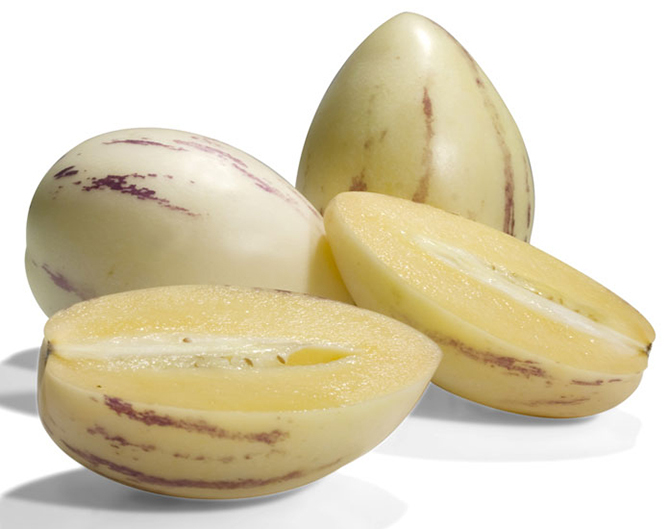 Though its name means “sweet cucumber” in Spanish, this fruit looks like a melon and tastes a bit like a honeydew. 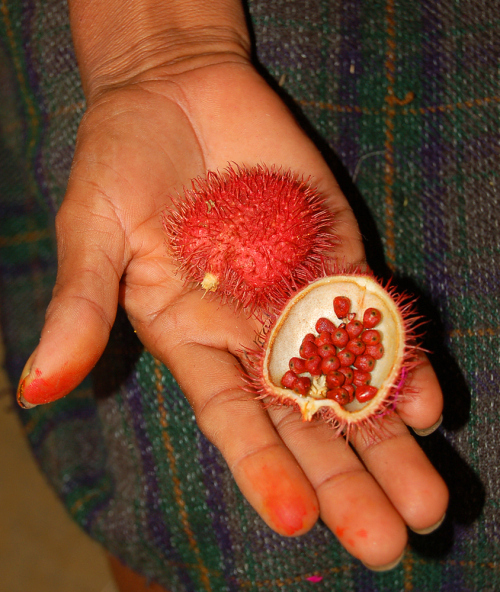 Due to its sensitivity to the rigors of travel, pepinos dulce are generally to be found close to home, in markets in Columbia, Bolivia, Peru, and Ecuador. Nevertheless, it’s hardy enough to grow in some temperate climates, so keep an eye peeled at your local grocer. The apple-like taste of this palm tree fruit doesn’t quite fit with its image. 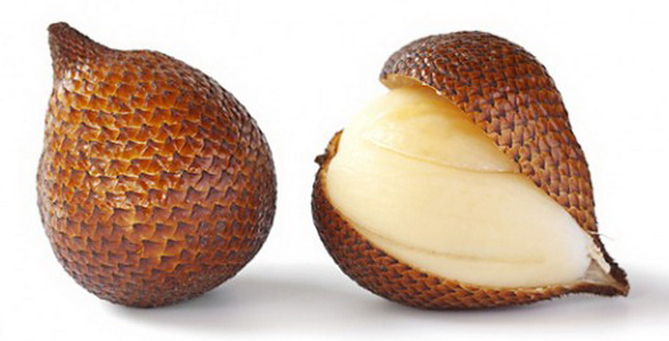 Salak is often known as “snake fruit” thanks to its scaly skin, which peels off to reveal three fleshy lobes. Anyone who cooks will notice how strikingly those resemble garlic! To eat a salak, grab the tip and pull. The skin will come right off. This is one fruit you’re probably going to have to travel to enjoy. Rose apples aren’t apples or roses, and they quickly lose their crispness after they are picked. A native of Malaysia, rose apples now grow around the world in warm, wet climates, where children often pick and eat the ripe fruit. 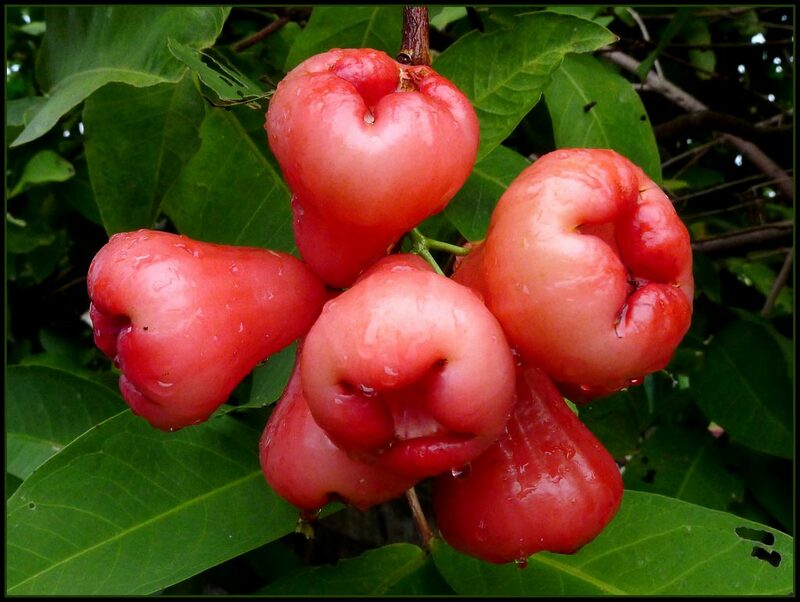 If you were to cut a rose apple in half, you’d find it somewhat hollow, like a cup. Some adventurous home chefs have taken advantage of this piece of evolutionary luck to stuff rose apples with rice and meat. 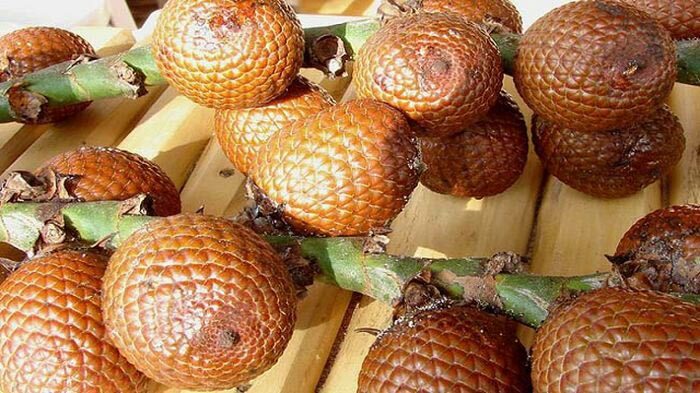 This is one fruit with many names! Sugar-apples are easily cultivated and regionally popular from Germany to India. In Haiti, they’re known as kachiman, in Iceland, as hvaðerþetta. Nobody cooks sugar-apples, but instead pulls them apart and eats the flesh, spitting out the poisonous seeds. 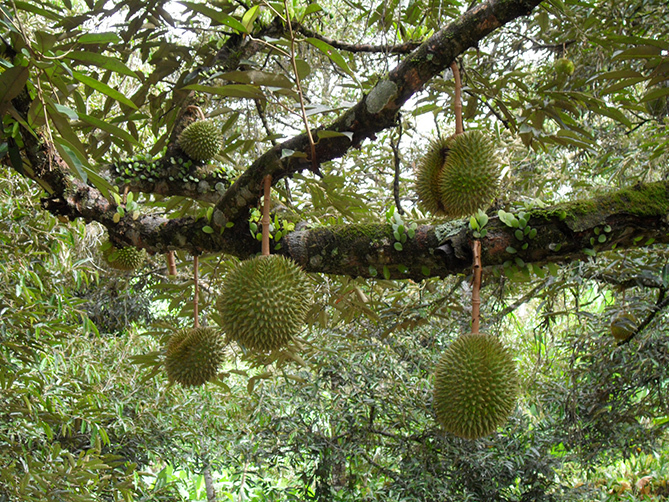 In Malaysia, the fruits are run through sieves, which removes the seeds without the need for spitting, and added to ice cream. 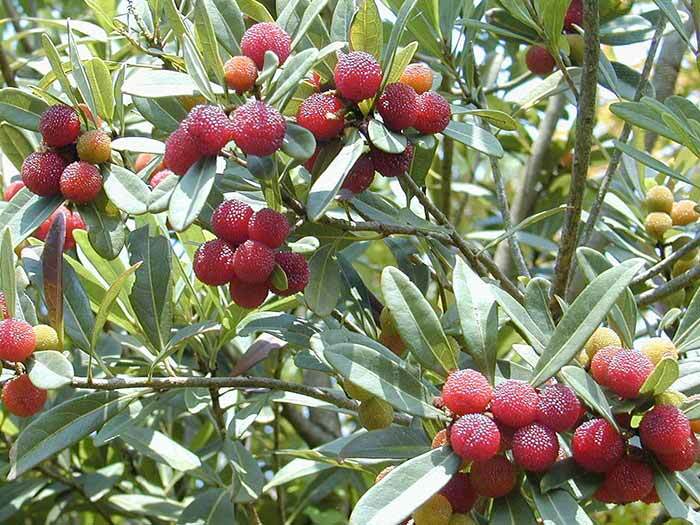 Myrica trees are popular ornamentals, and their adorable, bumpy berries probably contribute a great deal to their likeability! Chinese cultivators have grown myrica for close to 2000 years, during which time it has been dried, juiced, made into jam, and marketed as “Yumberry” in the EU. Of the two types of myrica, one is sour and the other sweet. 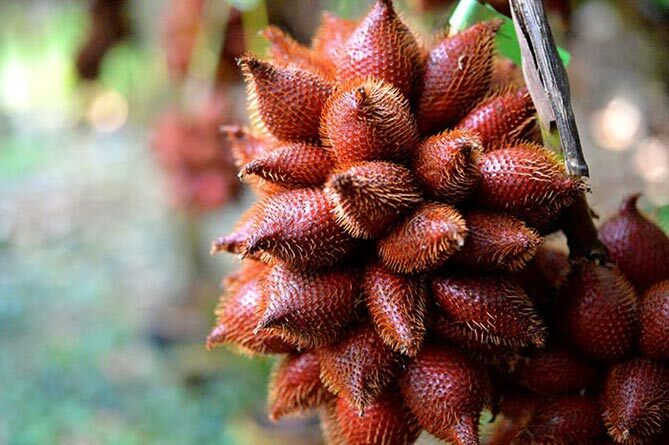 The sweet fruit makes much better eating, but if you buy myrica fruit leather while in China, that will probably come from the sour variety. Fun as it may be to de-scale an aguaje or brave a durian, we all know that the real action happens in the vegetable world. Cleanse your palate and prepare to revise the dinner menu, because you’ll want to include some of these wonderful and weird-looking vegetables! 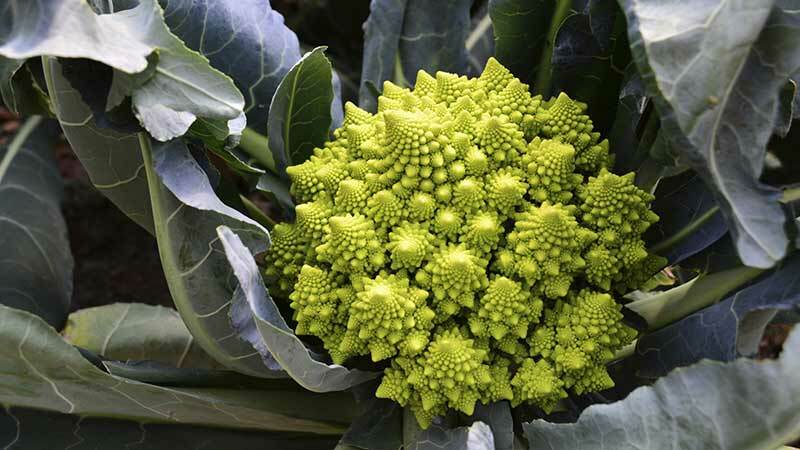 The only way to begin this list is with the famous fractal cauliflower variety, romanesco. Believe it or not, the spiral whorls of this incredible plant follow the Fibonacci spiral pattern. Though you might be reluctant to ruin the beauty of the romanesco, you’d also be cheating yourself if you didn’t toss it into your stir-fry. 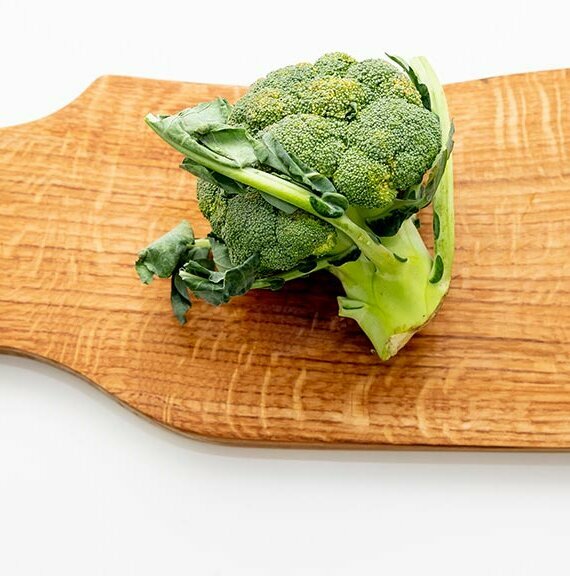 Like most broccoli cousins, this vegetable is incredibly nutritious and contains large doses of vitamins C and K.
Particularly popular in New Zealand but originally a staple crop in the Andes, certain varieties of this highly nutritious root vegetable taste like apricots! It’s not a true yam, but if you run into one in a grocery store, that might be what it’s called. 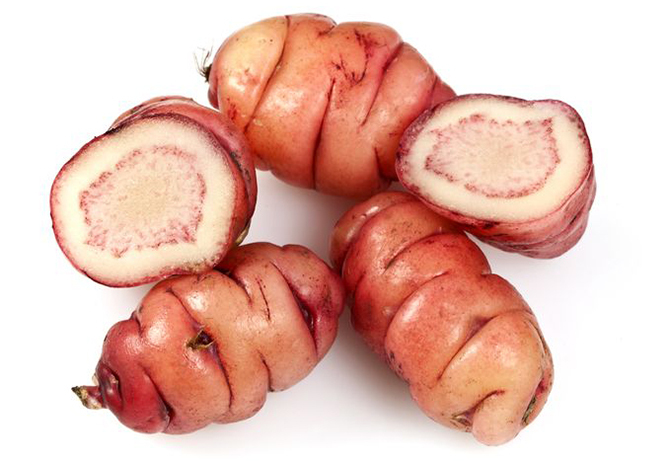 Oca is particularly well-known for its wild colors, from bright red and purple to creamy tan, sometimes on the same tuber! 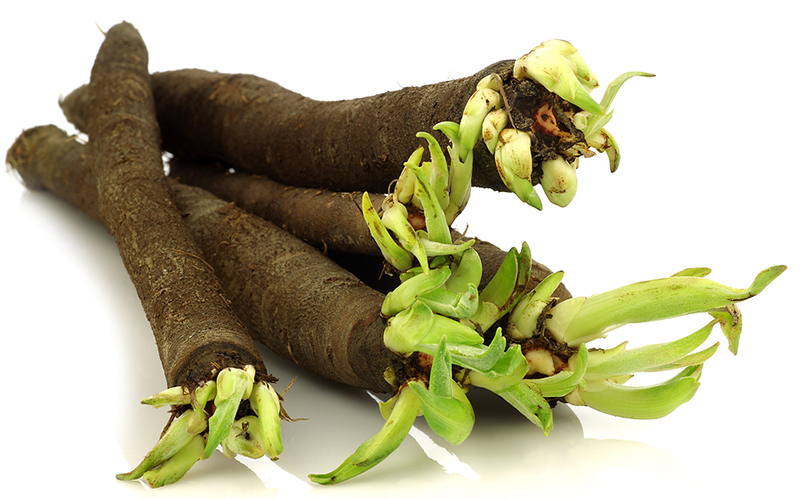 Though you might not see it on grocery shelves much today, black salsify has been cultivated in Europe for hundreds of years. In fact, Germans believed that salsify was a good treatment for bubonic plague until the 16th century. Though it’s not widely used for medicinal purposes, salsify is very nutritious, containing A, C, B, and E vitamins as well as potassium. To prepare, boil the entire root for twenty minutes, strip the bark, and serve with other root vegetables, like carrots. 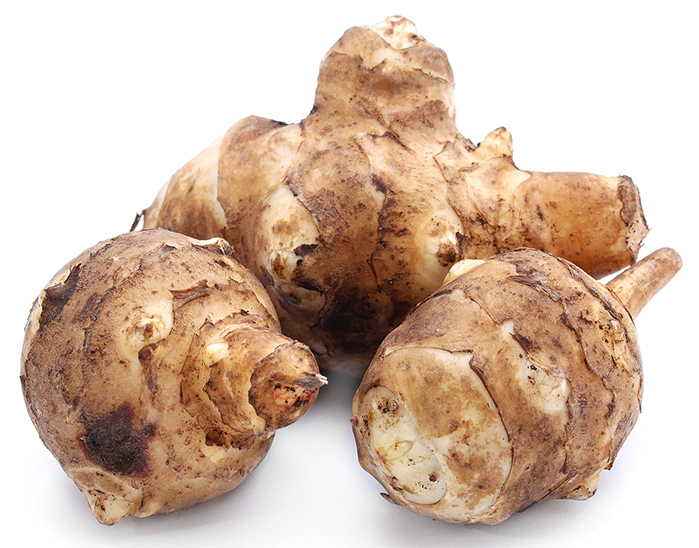 The reason why this veggie is known as a “Jerusalem artichoke” is something of a mystery, since it originally grew in North America. A member of the sunflower family, this root is a good substitute for potatoes. Its flavor is a bit nuttier, but that only gives it an advantage in its distilled form, brandy. If you decide to dine on Jerusalem artichokes, beware: much like beans, sunchokes often cause flatulence. 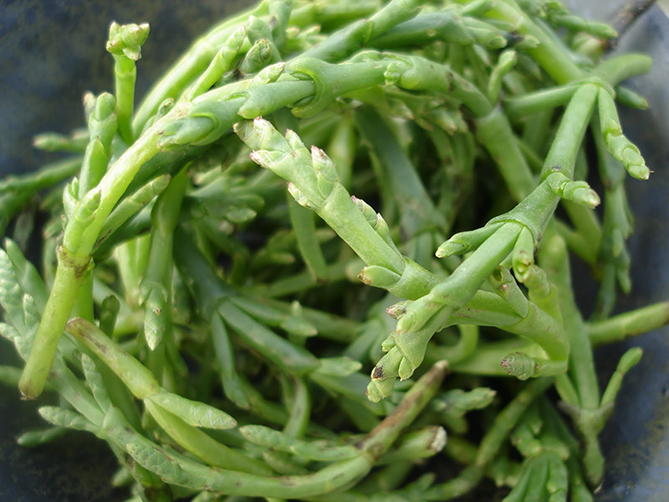 Vegetables don’t normally grow on rocky beaches, but that’s exactly where you’ll find samphire. You’ll see it on sale in coastal areas of Great Britain, where it was once used to make glass. 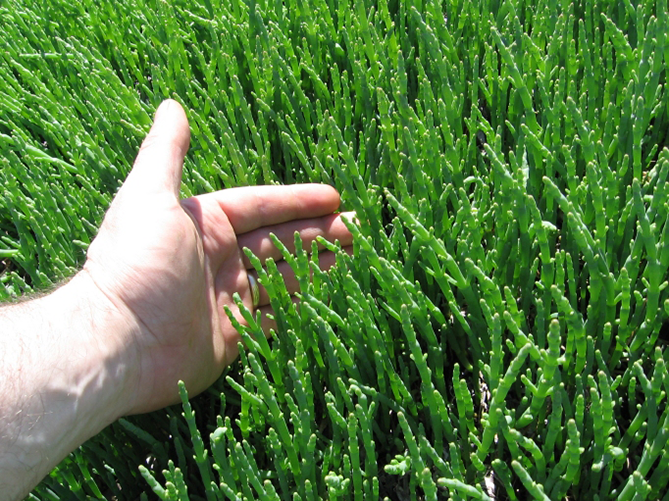 Gathering samphire used to be a dangerous business because it required someone to climb up and down rocky cliffs. In fact, none other than William Shakespeare commented on it, stating in King Lear that harvesting samphire was a “dreadful trade”. Luckily, samphire harvesting has become more mainstream as the plant shows up in restaurants and, perhaps soon, in biodiesel. 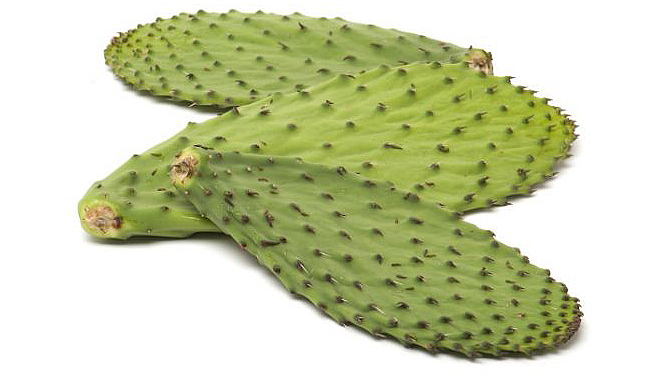 Made from the Opuntia cactus, nopal is, not surprisingly, fairly hard to get at. To eat nopal, a preparer must first carefully remove the spines. Then, the meat can be eaten raw, cooked, or turned into jam. 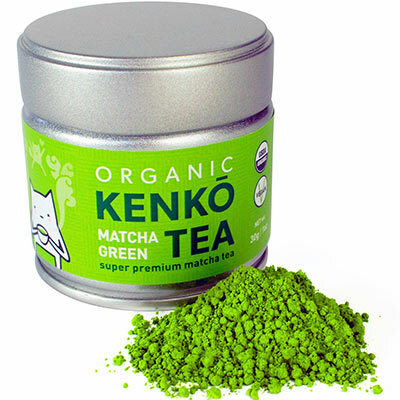 Many people find that it has a slightly tart flavor, like green beans. New Mexican and Tejano cuisine has hopped on the nopal bandwagon, serving many varieties of this versatile and unusual veggie. 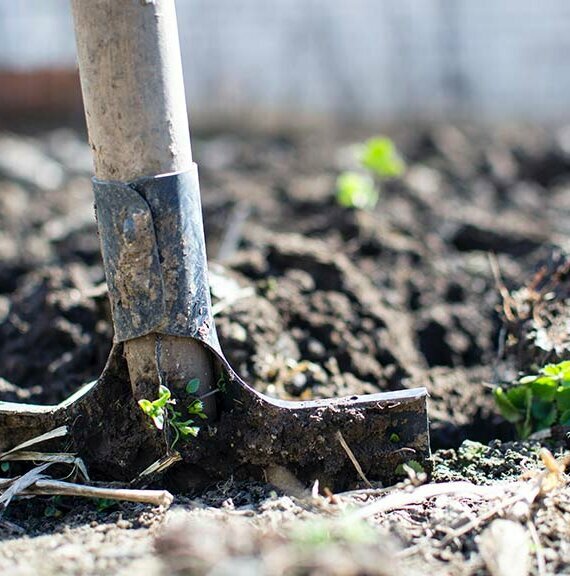 If you happen to like growing your own veggies, but you hate sitting around and watching them grow so slow, then the yardlong is probably your cup of tea. These beans grow so fast that it’s important to check them every single day. Once they’re mature, yardlongs can be used much like green beans. They are good in stir-fries, and can also be eaten raw. For the most part, you’ll find them in China and northern India. There’s at least one good culinary excuse to travel to New England: fiddleheads! These weird-looking spiral plants are actually immature ferns. They can’t be cultivated, only harvested from the wild and then only by professionals. (Much like mushrooms, some ferns are poisonous.) 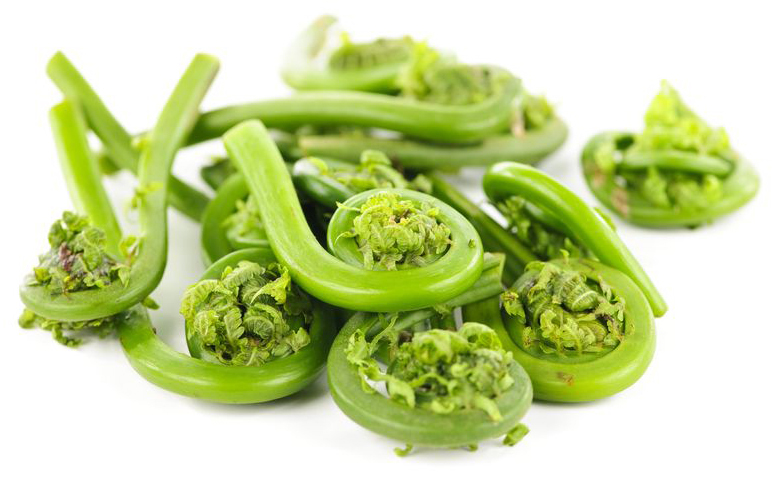 Despite the difficulty of obtaining them, fiddleheads are delicious and contain a huge amount of antioxidants. If you’re wondering where they get their musical name, then look no further than you nearest symphony orchestra. Shape-wise, fiddleheads are strongly reminiscent of the narrow end of a violin. You’ve eaten potatoes. You may even have eaten sweet potatoes. But you haven’t lived until the sweet potato on your plate is also purple. Yes, it stays purple even after it’s been cooked. Consider the opportunities for creatively decorated dinner fare officially expanded. 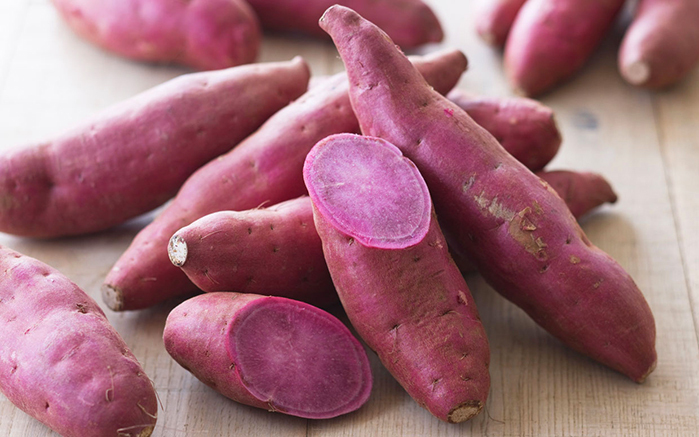 These days, you won’t even have to travel to Stokes County, North Carolina to try a purple sweet potato. These roots are gaining in popularity and are now grown in California. They’re related to the morning glory, but taste way better. Sometime, we’ll have to do a segment on weird nuts, but today, the only nut on our list is actually a root vegetable. And what a vegetable! 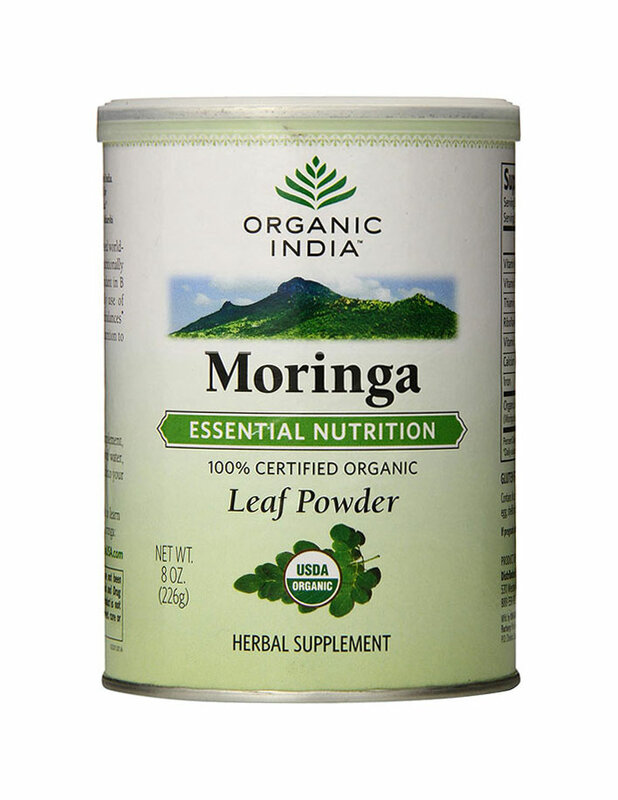 The ancient Egyptians were the first to realize that the root of the chufa sedge plant made a delicious addition to dinner, boiling them in beer and even burying their dead with them in some cases. 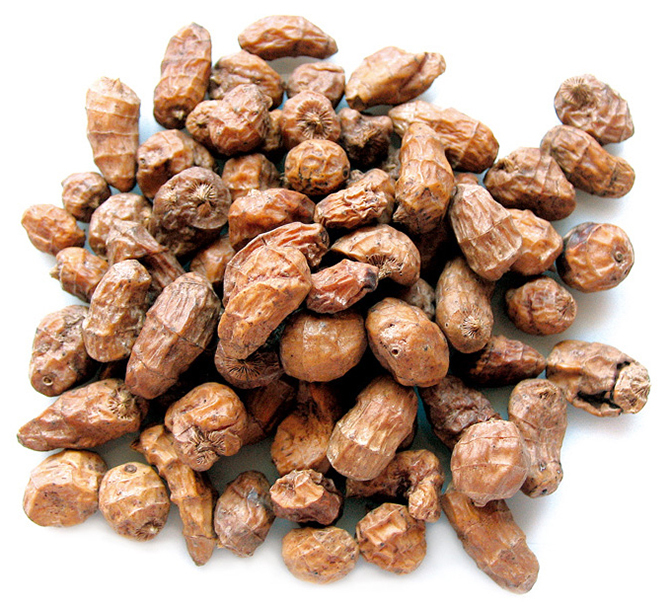 In Spain, you’ll find tiger nuts in horchata, sometimes replacing milk. 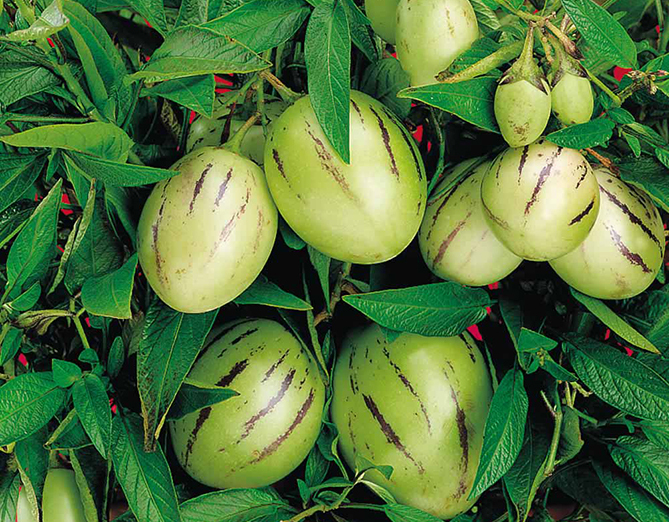 Additionally, the tiger nut is extremely starchy and packed with vitamins C and E.
Tomatillos are actually fruits that are closely related to physalis. But once you pull off the papery outer coating, you can prepare and eat it just like a tomato. Mexican food has long celebrated the tomatillo’s tartness, which makes it appropriate for certain sauces. Some varieties also make good jams. 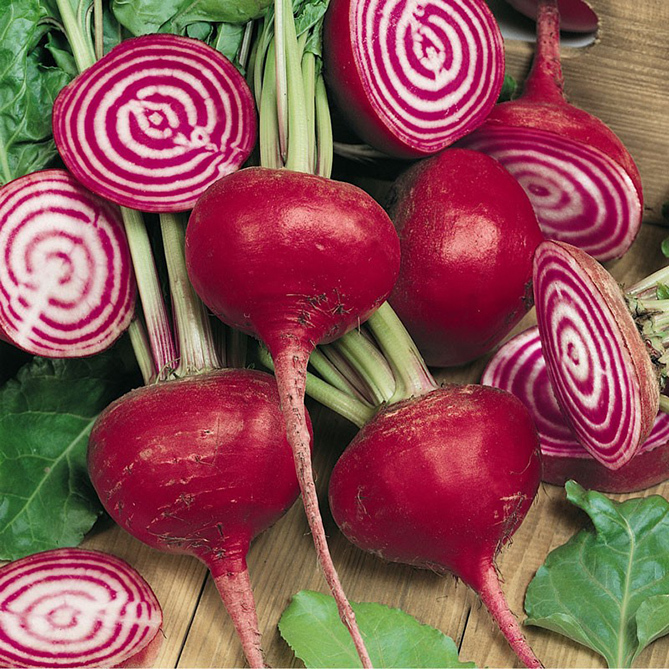 If you cut a chioggia beet in half, you’ll find a surprise: rings of red concentric circles in the root’s white meat. It looks no less strange from outside: a number of roots tap down from the roughly heart-shaped main body. Despite the weird look, this beet is known for being much sweeter than regular beets. A bit of lemon juice or vinegar will prevent the colors from fading while you prepare them. 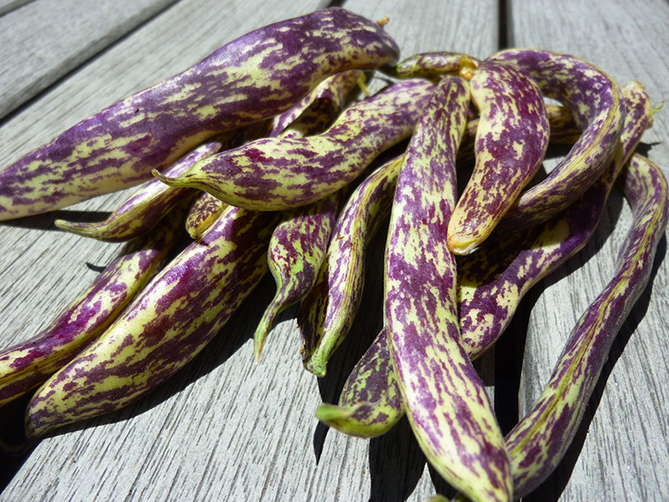 Just like sugar snap peas, these beans with colorful husks can be eaten. In fact, they taste best raw, though they can also be steamed or pickled. 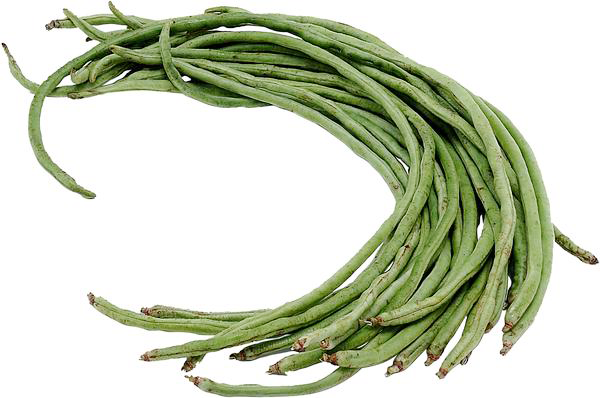 A Netherlands invention, the ability of dragon tongue beans to survive in a wide variety of climates has allowed its cultivation to spread around the world! 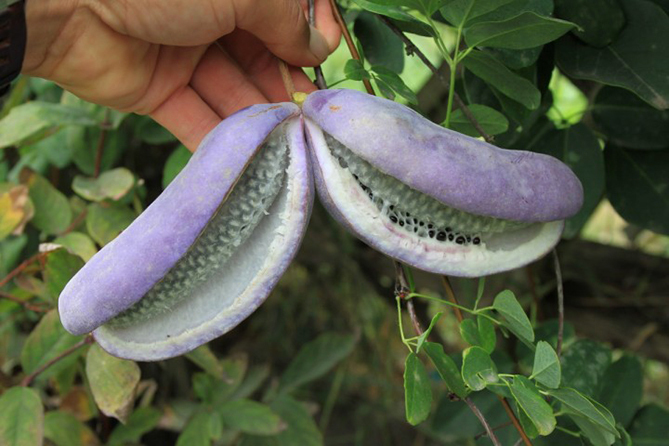 Some of the world’s weirdest plants are also its tastiest. If you’re looking for a new culinary experience, then a tomatillo or a cupuaçu might be perfect for you. Since so many of these odd foods are from other countries, a brand-new veggie might be the perfect thing to broaden your cultural awareness. One thing’s for sure – you won’t be bored!